So as a result of the slow cooking thread I thought I'd expand out onto a related subject: the art of low 'n slow barbecuing. I'm sure everyone is familiar with the standard BBQ fare of sausages, burgers, kebabs and steaks which are all grilled directly over the coals/gas with a high heat and over a short cook time. Grilling is great (grate?) but your barbecue is capable of so much more! Whole chickens, lamb legs, pork shoulder, whole racks of ribs and so much more are possible and surprisingly easy to cook this way. For those who already cook this way, please do contribute other recipes and tips. For those who are curious, read on! There are other gadgets and gizmos you can get which makes things easier but the only one I'd strongly recommend is a food thermometer. It'll help you tell if that roast is done to the middle and they're available for under a fiver. If you're feeling flush you can upgrade to a digital one, in this space many people swear by Thermapen. Many manufacturers build thermometers into the top of the BBQ, DON'T rely on these. They tell you the temperature of the lid, which is only useful if it's the lid you're planning on eating. Another cheap one that can be helpful if you have a charcoal barbecue are some welding gloves for under £10. Why? Because the food is likely to be cooking for 4-8 hours depending on the recipe and one set of coals will not last that long. So when they start to get low you're going to need to top up by adding more coals on top of the already burning ones. As you can imagine these are likely to be very hot! The gloves allow you to place coals easily and accurately without burning your hands. Burgers and sausages are cooked directly over the coals/burners (called direct heat,) but for a slow cook this would lead to the outside being done while the inside is still raw. 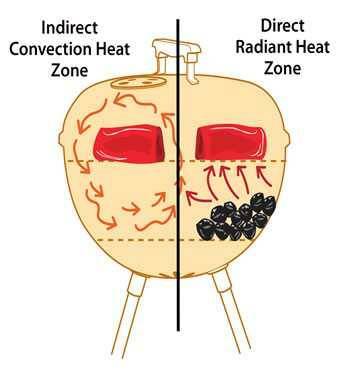 Instead with this method the burners/coals are to the side of the food being cooked (indirect heat,) with the lid/hood of the BBQ down, this allows the heat to reflect back from the top and cook the meat from all sides. I use a charcoal BBQ so tend to stack the coals at the two sides of the base level, with a drip tray or some tin foil in between them to catch the fat. 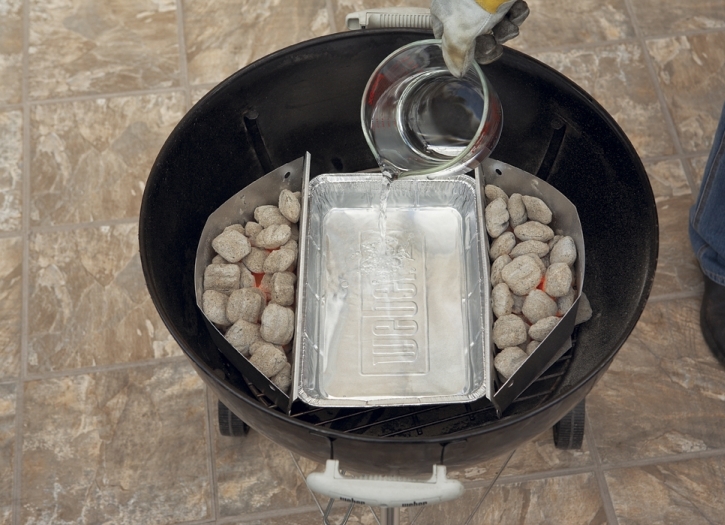 If you have a Weber or some other makes they provide baskets or bars that hold the coals in place (see pic, the water is optional but tends to stabilise the heat a bit,) With gas it's easier, you simply light the burners on the other side of the grill to the food. Most recipes will have a target temperature, BBQ is an art not a science, so don't worry about hitting it spot on like you would an oven. Adjusting the knobs on the burner or the top vents on a charcoal model until you're within circa 30c of the optimum. Add the meat and SHUT THE LID. This is the single most important thing about low and slow. The lid is like the oven door, and should only be opened every 30-60 minutes to quickly probe the meat and/or top up the coals. Lookin' ain't cookin'. You'll know you've got the indirect heat working properly if you don't need to turn the meat, the top should look as done as the bottom. This is a great one to begin with as it doesn't take that long, it's easy to tell if it's cooked and chickens are cheep (sorry!) so if you get it wrong you won't have spent much. Take a whole chicken (giblet free.) Rub a tiny amount of olive oil (it has a higher burn point than most veg oil,) all over the skin to crisp it then sprinkle salt and pepper over it. Optionally rub some fresh rosemary on, the oil tends to slacken the skin and you can sometimes get the rosemary in underneath it. 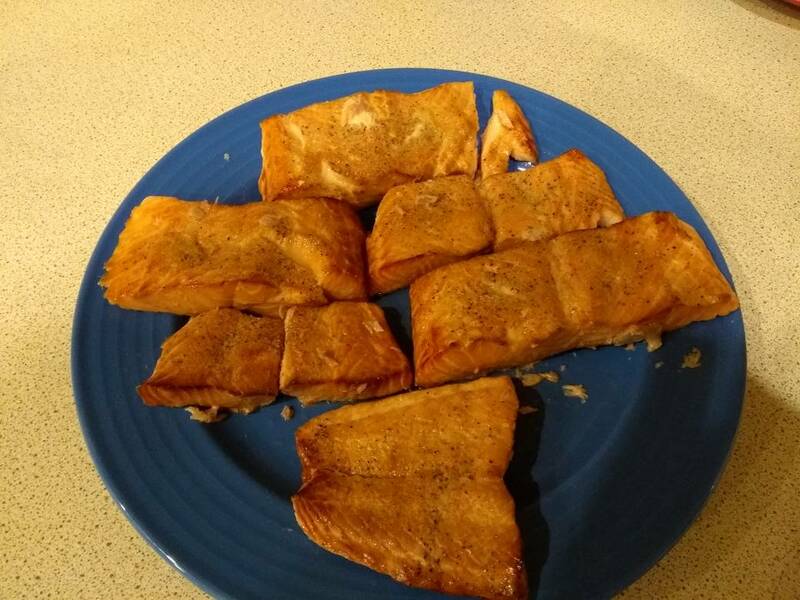 I've only been doing this 3 years so I'm sure there are others on here who know more than me so please share tips/recipes. I've tried both gas and charcoal, currently have a gas one. I like the taste of the traditional charcoal but the convenience of the gas. I've played with other peoples gas ones, but I'm happy with my Weber kettle for now. It's taken me a while to learn it, how quickly it gets through coals, how well it holds heat etc. so I'm happy to stick with it for now. I know it's been done to death by gastropubs but it tastes amazing when it's been done over smoke, it's a cheapish cut of meat and it's also great cold in sarnies. 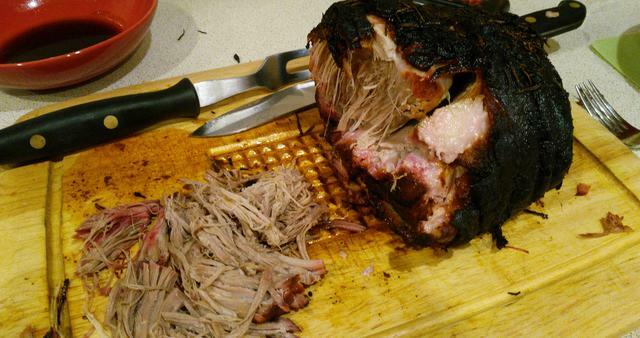 Get yourself a pork shoulder and trim off any excess fat at on the top, leaving just a small layer. Then wash the pork with water and pat dry with kitchen towel. Next you want to add a dry rub to the meat, this will harden to form what's called a bark. Everyone has their own recipe but mine involves 4 parts brown sugar (the base of any pulled pork bark,) 2 parts paprika, 1 part salt, and a tablespoon each of black pepper and mustard powder. If you make a big batch of this you can keep it in Tupperware and use it next time. Cover all of the pork with the rub, and don't be shy with it. Set the BBQ up for indirect heat and get the temperature around the 200-220c mark, but definitely no higher than 240c. It's going to be in there a long time so a little too low a temp is preferable to a little too high. Add the meat to the BBQ and cover. It'll take somewhere around an 1 1/4 hours per pound of meat to cook so for a good sized piece you're looking at around 5-6 hours. When you're about an hour away take the meat out and wrap it tightly in foil with a splash of water inside before re-adding to the BBQ for the last hour. This is called the Texas Crutch and its a method (some call it a cheat!) to speed the cooking slightly but more importantly to stop it drying out. Opinion is divided on if it's worth it but it works for me. While the outside may look a bit burnt it's actually a lovely sweet crust. My phones camera probably doesn't help. Also notice the pink colouring just below the skin/fat layer. This is called a smoke ring. You'll get this on all slow cooked barbecue meat and it doesn't mean it isn't cooked. Sciencey details in the link. This is a handy one as it lasts for days and is a lot cheaper than ham from a shop but it does need a few days notice. Grab an unsmoked gammon from the supermarket. Now gammon is quite salty, so we need to get that out, so also buy a 2ltr bottle of the supermarkets cheap own brand cola. Not the diet one, the full of sugar lardy coke. 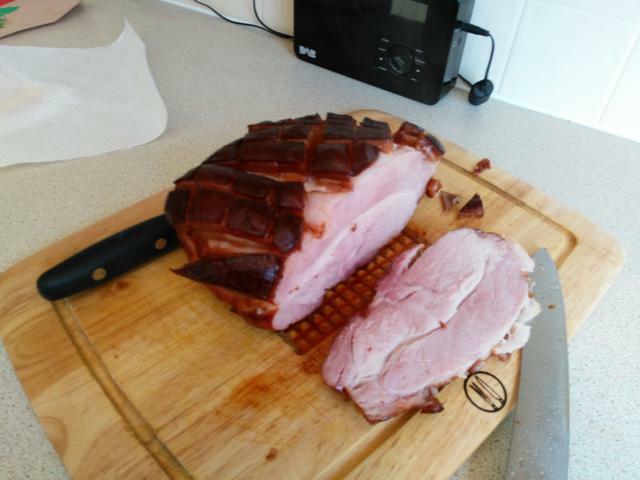 You're going to leave the gammon in a bath of the cola at least overnight but ideally for 24 hours, if you have a baster you can even inject some of the cola into the middle of the ham to speed things up. After this score the fat on top of the ham diagonally, into a sort of diamond cut. At this point there are a myriad of different glazes you can coat it with before cooking but I'd recommend going without the first time as a benchmark. This is what panics a lot of people. If you're cooking a big piece of meat on a barbecue for more than 2 hours or so you'll probably run into The Stall. This is the point at which the internal temperature stops rising every time you probe it even though the BBQ is hot and the meat isn't done yet, usually around the 65-70c mark internal temperature. DON'T PANIC. Don't turn up the heat, don't finish it off in the oven, it's perfectly natural. The cause is evaporative cooling. You've reached the point where the moisture coming out of the meat is cooling it at the same rate the BBQ is heating it. Effectively the meat is sweating, just like we do when we're too hot. It may hover at that temp for 2-3 hours but eventually most of the moisture near the surface will be gone and the temperature will begin to increase. This is a GOOD thing for most dishes, although not the pulled pork. The middle of the meat will still be moist but you remember that lovely pink 'smoke ring' and the surface 'bark' I mentioned earlier? That's a result of the surface drying out and it's full of flavour. That said, if you're on the clock and don't mind sacrificing taste for time, you can use the aforementioned Texas Crutch to get around the stall. By wrapping it tightly in foil the meat can't sweat out the moisture, so the temperature rises more quickly but you lose some flavour. This one is good even if you're just grilling burgers. 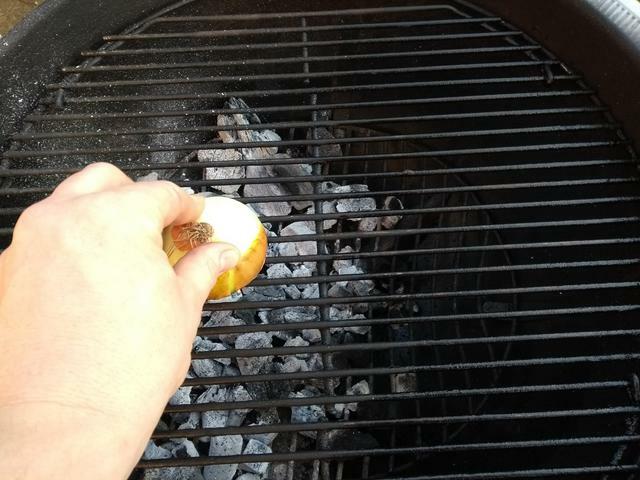 To prevent the meat sticking to the grill, immediately before you begin cooking cut an onion in half and rub the grill bars down with the inside. Not only will this reduce sticking but the only residue is a bit of onion flavour, what's not to like? Also, always try to clean down the grill bars when they're still warm. A wire brush will do the trick and it comes off much easier than if you let it cool. 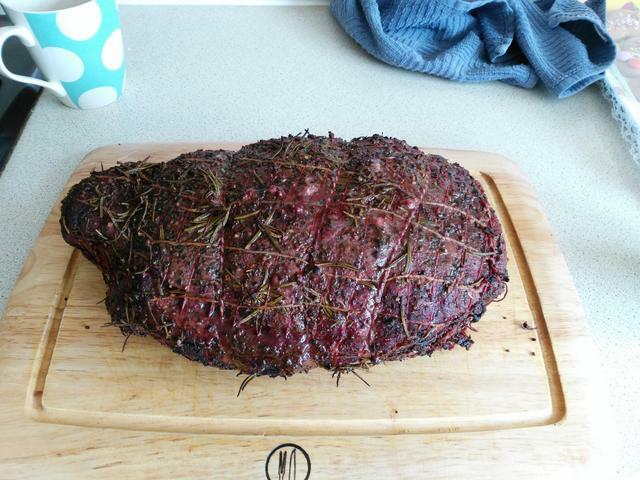 I've got a couple of other recipes to add at some point, including a lamb leg and a few bits about other kit that comes in handy if anyone finds this useful/informative? Feedback (good or bad,) happily received! 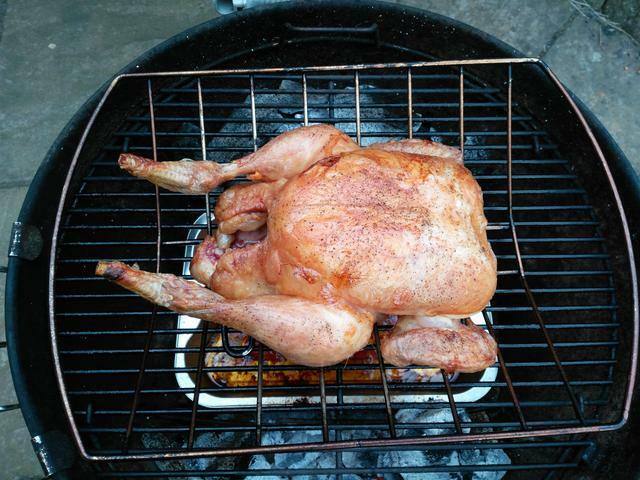 Remember: a BBQ is for life, not just for Christmas. There are also, I've learned, some recipes that make me truly grateful I'm not a chicken. It's bad enough being barbeque'd (I imagine) but ..... beer can? Eeek. That said, I s'pose a large orange, an onion and a sprig of rosemary is no fun either. I always get told the opposite, usually by gas fans who laugh at the mere suggestion of using coal or even wood... They'll cite numerous science articles and the like, yet with all their science none have actually been able to match a decent wood braai! Agreed. While I've tried to remain neutral in this thread I'm definitely in the wood/charcoal camp in the wood Vs gas BBQ debate. If you want to cook on a gas BBQ you may as well use the hob and open the windows. You don't get the fat dripping onto the vaporiser bars/lava rocks cooking on a hob. I go with gas because I like not having a 1/2 hour window in which the heat source is at the right temperature to cook with, but each to their own. Well I have a stack of braai wood airing out, and a promise that the Ttaskmistress will be buying some more of those nice venison fillets we had at Christmas, for me to slap on the grille once the season begins!! That's why it's an art, not a science. If you simply dial the settings in, cook to scientific perfection and are all done within half an hour, you might as well just order a McDonalds. This is the same level of art as the guys who keep a pipe going for several hours. With any decent BBQ (i.e. any that has a lid,) after a few goes you learn how it retains heat and any fettling you need to do. As an example when I'm doing a beef joint once I've got the coals in and the beef on it'll hold temperature and not need touching for a good 90 minutes or more. Even then it's just add a few unlit coals on the top and then it's good for at least another hour. 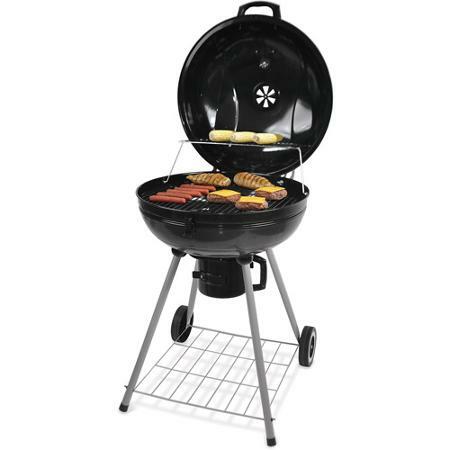 Another top tip: if you have a BBQ with adjustable vents at the bottom as well as the top (all Weber's and most Weber-style ones do this,) then when it's empty move the lever and use a permanent marker to note where fully open, fully closed and half open are next to it as you won't be able to see from inside once it's full of coals!